If you stand still for too long around here these days, I will wrap you in a garland and lights! 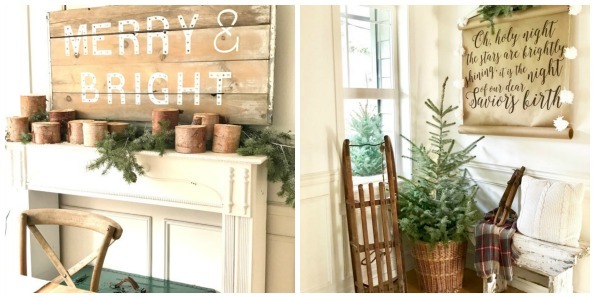 We are enjoying pulling out all the stops in making our house Merry & Bright! Three blog tours this week have my head spinning with fabulous ideas & of course, all the inspiration many of you share here each week keeps the ideas flowing. If you haven’t already visit my post on my front porch – HERE. In that post is an easy opportunity to win a $250 gift certificate to French Garden House! Wrapped in garlands or not, let’s all embrace the season, cast off holiday stress and enjoy the season! Cynthia from Clockworks Interiors shows us how to make gorgeous glass glitter. So sparkly!! Mariah from Giggles Galore shared her recipe for these adorable and scrumptious looking mini lasagna roll-ups. Perfect for holidays parties! Even potlucks – ok, you may know how I feel about pot lucks. Brandy from Gluesticks showed us how to make her gorgeous Winterberry Wreath! So simple, but so beautiful! Love all the inspiration here….thanks for hosting and have a very Merry Week! Love the tip about the blue tape. Checked out all French Garden’s beautiful items and I collect silver baby cups. What a lovely thing to collect Starr! Good luck!